Spicy, dark cherry entry leading to a pleasantly structured mid-palate filled with well-defined tannins and oak. This zesty zin is ready to drink right now or may be laid down for future enjoyment. Sonoma County is home to many wonderful and unique growing regions for Zinfandel. The primary source of our spectacular Sonoma County Blend is grown on Madrone Estate in Sonoma Valley where the days are warm but regulated by foggy mornings. This allows the fruit to ripen but maintain a high level of fruitfulness. 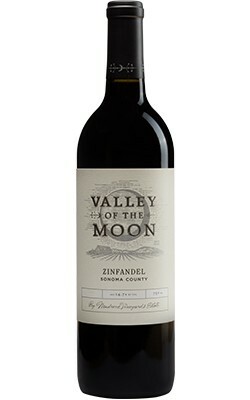 The Dry Creek Zinfandel portion of this blend adds spiciness as the days reach higher temperatures. At night, the marine influence cools off the fruit which allows for a beautiful variance in climate. Each region is fermented seperately to capture their character and combined to form a very tasty, well balanced story of Zinfandel in Sonoma County. Valley of the Moon wines are produced by Madrone Estate Winery, one of Sonoma Valley's oldest and most historic winery estates. Originally founded in 1863, the Stewart Family purchased the estate - then named Valley of the Moon - in 2012 and completed a renovation to focus on estate-driven, small lot wines from the historic property. Valley of the Moon wines honor an important 75-year era when Italian proprietors Enrico Domenici and Henry Parducci grew grapes and made wines at the estate.